Mr. T and I used to love Dylan Prime. It was the first steakhouse we went to in the city and I have fond memories of their cheesy fondue and luscious meat dipping sauces. So when I saw Urban Daddy offering $20 certificates for a full brunch, cocktail and dessert included, I jumped on it. Mr. T and I arrived on Sunday right around 1:00 pm. Brunch at Dylan prime is served in their bar/lounge area, which was perfect for me because I wanted to watch some football. 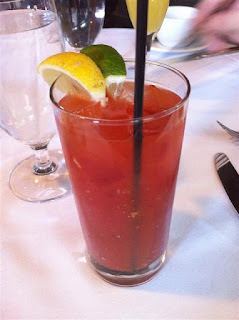 Our waiter was familiar with the Urban Daddy deal so he took our certificates right away and set us up with some Bloody Mary’s. Our choices for first course were Lobster Bisque or Mixed Green salad. 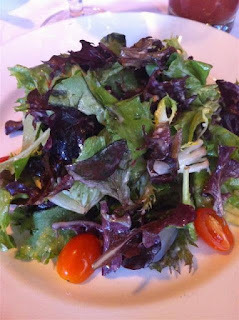 I was feeling a little unhealthy from the my beer and meat fest Saturday night so I got the salad. The greens were simple, dressed in a Dijon dressing with teardrop tomoatoes. It was very tasty. Mt. T got the lobster bisque which was finished off with a brandy crème on top. Damn me for thinking healthy. 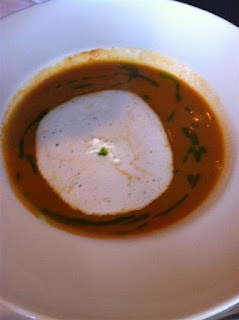 This soup was wonderful and just what I could have gone for on the first really cold autumn day. 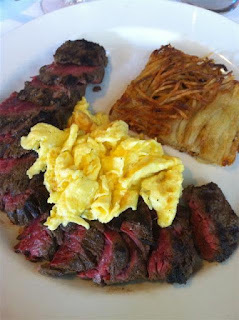 For our main course we got steak and eggs with a choice of Skirt Steak or Hanger Steak. I can never remember which one I enjoy more so I went for the Hanger Steak. My meat was cooked perfectly just as asked but I didn’t love the meat per se. It was a little on the fatty side and had a chewy texture in spots. Mr. T ordered the Skirt Steak and I ended up liking his cut of meat better. Although it doesn’t look as pretty as mine the steak had a better flavor and texture overall. 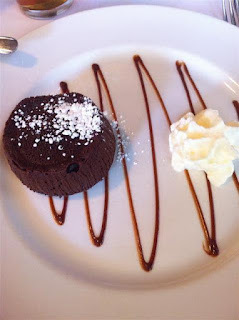 For dessert we were each given a Molten Chocolate Cake with whipped cream. I was a little sad to see only whipped cream on the side. Usually molten cakes come with some sort of ice cream on the side. I really missed having a cold creamy side to mix the warm chocolate center with. Overall the brunch was a good deal and the food was tasty. They have this special at the restaurant as well but for $20 you don’t get the dessert unless you have the Urban Daddy coupon.